The Redskins last went to the semi-finals in 2013. Unlike 2013, the Redskins’ 2018 season finished there after a tough 35-20 loss to Deshler last Friday. The Tigers took control almost immediately when Deshler scored a 60-yard touchdown on their first snap. Before the first quarter ended, Deshler scored 14 unanswered points. Oneonta began to come alive in the second quarter when Taveris Hill connected with Brandon Howard for a three-yard touchdown pass. The Redskins went into halftime 14-7. The game began getting out of reach for the Redskins when Deshler scored two touchdowns to begin the third quarter. Oneonta scored once in the quarter with less than a minute remaining when Hill threw a 36-yard pass to Howard, making the score 28-14. 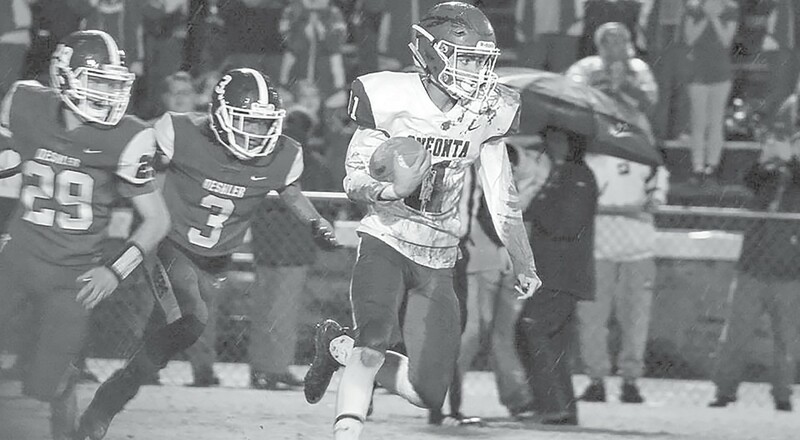 Both teams scored once in the fourth quarter, Deshler on an 18-yard pass and Oneonta on a Hill three-yard run. Hill completed 19-of-37 for 229 yards and two touchdowns with two interceptions. Howard led the Redskin offense with 149 yards and two touchdowns. David Hall had 44 yards on 10 carries. Jaden Kent had 43 receiving yards. Hill had 42 rushing yards and Riley McGill had 25 rushing yards. Hill finishes the season with amazing stats totaling 1,453 all-purpose yards. Howard had 1,019 total yards, Kent had 963, and Hall had 747. On defense, Beau Ragsdale led with 11 tackles, one for loss. Kent had seven tackles. Hall and Howard both had six tackles. Ragsdale punted three times against Deshler with an average of 41 yards per punt. Howard had one blocked punt in the game. Ragsdale finishes the season with 186 total tackles, 27 for loss and four sacks. Hall had 135 total tackles, 16 for loss and six sacks. Kent had 121 total tackles, eight for loss and one sack. Luke Hodge had 111 total tackles, nine for loss. Oneonta finishes their season 10-4. After the turn around from last year and the amount of young talent, it is safe to say the future looks promising for the Redskins.